New Mars Global Surveyor images reveal sedimentary rock layers on the Red Planet that may have formed underwater in the distant martian past. December 4, 2000 -- In what ultimately may be their most significant discovery yet, Mars scientists say high-resolution pictures showing layers of sedimentary rock paint a portrait of ancient Mars that long ago may have featured numerous lakes and shallow seas. "We see distinct, thick layers of rock within craters and other depressions for which a number of lines of evidence indicate that they may have formed in lakes or shallow seas. We have never before had this type of irrefutable evidence that sedimentary rocks are widespread on Mars," said Dr. Michael Malin, principal investigator for the Mars Orbiter Camera on NASA's Mars Global Surveyor spacecraft at Malin Space Science Systems (MSSS), San Diego, CA. "These images tell us that early Mars was very dynamic and may have been a lot more like Earth than many of us had been thinking." 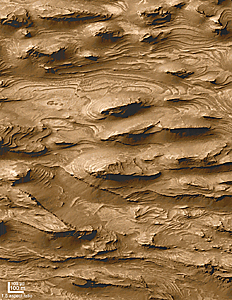 in the great martian canyon Valles Marinaris. The uniform pattern -- beds of similar properties and thickness repeated over a hundred times -- suggest that deposition was interrupted at regular or episodic intervals. Patterns like this, when found on Earth, usually indicate the presence of sediment deposited in dynamic, energetic, underwater environments. 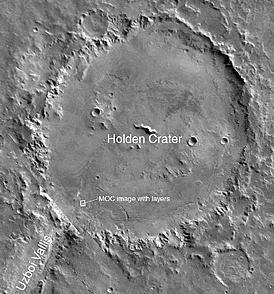 Malin added, "I have not previously been a vocal advocate of the theory that Mars was wet and warm in its early history. 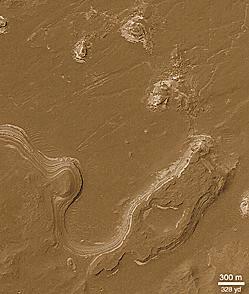 But my earlier view of Mars was really shaken when I saw our first high-resolution pictures of Candor Chasma. The nearly identically thick layers would be almost impossible to create without water." Malin Space Science Systems -- MSSS operates and processes data from instruments on planetary missions under contract to the National Aeronautics and Space Administration (NASA).